I had to finish my bedroom. Remember the pillows I made here, here, and here? Well, I had to splash more of that fabric by Amy Butler up on my windows. All neatly gathered below a panel of floppy ties at the top. I’m in love with this fabric…..but you probably already knew that. I made 2 hanging panels to cover our bedroom window, but I will give you the directions to make one panel. (my window measures 70 inches wide by 52 inches tall. First, I cut a panel for the top of the curtains that was 38 x 11 inches. I ironed the very ends towards the inside of the fabric, 1/2 an inch. Then I used 4 yards of fabric, that was 45 inches wide, and cut it into two 2 yard pieces……so 2 pieces that were 45 x 72 inches. Then I sewed the two pieces together (with right sides together) along their long side (72 inch side). So I had a great big piece that was 90 x 72 inches. Then, I made a basting stitch 1/2 inch from the edge along the width of the fabric (the 90 inch side) and gathered the fabric all along the top. Then I pinned it to the long edge of the top panel, with right sides together. Make sure to evenly space all of your gathers. Then fold the other edge of your top panel towards the inside a 1/2 inch and iron in place. Then fold down and line up that edge with the seam you just made while attaching the gathered piece to the panel. Pin into place. Then carefully sew from the other side and remove your pins as you go. (If it seems a little too tricky to lift up the panel to remove a pin each time you reach one, put the pins on the front of the panel instead, to secure the back of the panel in place.) This step will help the front lay flat and finished while securing the other edge of the panel down to the back. And you want to sew from the front so that you can watch as you’re sewing and make an even stitch across the front. Now, sew the entire panel flat. Then sew the ends of the panel closed, making a seam really close to the edge. Then place 6 pins evenly spaced along the top of your panel. Now fold each tie in half to find the middle……..
…….and fold them over the top of the panel, where your pin was marking its spot. Then make a seam an inch away from the edge, securing the tie in place. And then flip both ends out, and make another seam 1/4 inch away from the edge. Make sure you have sewn the through both ties and the panel. Repeat with the other ties and you should have 6 ties evenly spaced along the top of the panel. **Then you can either hem the end of each tie, or tie them in a knot like I did. Easy and quick…..and pretty cute. Lastly you’ll hem the bottom of the curtain by folding it under a 1/4 inch and then another 1/4 inch and then sewing it in place. ………adorned with some floppy ties at the top. « Brand new sponsor and GIVEAWAY!! Cute curtains. Love the Amy Butler fabric. I like the white comforter with all of the different color. Very creative. LOVE it!!! Just out of curiosity, how much did you budget for fabric for your bedroom makeover (pillows & curtains)? Thanks!! I LOVE what you do! The Wright Family, I spent about $85 on fabric for the curtains and pillows at fabric.com. (But I used about twice as much fabric for my curtains to make them gathered and full as you normally would when making basic curtains.) I always search for a coupon code before ordering with them and found one for 30% off. I also bought the comforter at TJMaxx for $30. It's a king size, that hangs extra long over the edges of our queen bed, so then I didn't have to make a bed skirt. Anyway, so the total for that was about $115. love, love, love this fabric. wish it wasn't SO expensive. i've been searching for hours now trying to get all the fabrics i need to recreate your bed! i bought a white duvet cover with grey embroidery on clearance at target and now i am trying to recreate your beautiful pillows. thanks for finally helping me decide on a color scheme for my bedroom. I can't believe how EASY you make things look! I didn't think the room could get any more cute, but it did! Love these! LOVE your fabric choices! They look great! THat fabric is to die for! THe curtains are beautiful and that room… I just want to curl up on your bed…but that would probably freak you out. A little too goldilock. I absolutely LOVE it! I too wish designer fabric wasn't so pricey! Those curtains are amazing though and I love the whole look of the room. You are seriously making me want to skip past all my projects to redo my room—it definitely needs it the very very very most, but it's at the bottom of the list. Maybe I'll have to splurge! love love LOVE these curtains! we just moved and I need ideas for window coverings! thanks so much! I just found your blog and you are Amaaaazing! I love your ideas, you are so talented. Thanks so much for being willing to share all your ideas. I bought some mod podge today, to try making the necklace holder out of a frame. Thanks again! Can't wait to try these out! They would be perfect for my sewing room. Love it! I love these! What a great design and thanks for the tutorial. Word Verification: "ouper" – it ought to be Super. That is my favorite fabric combination of all time! 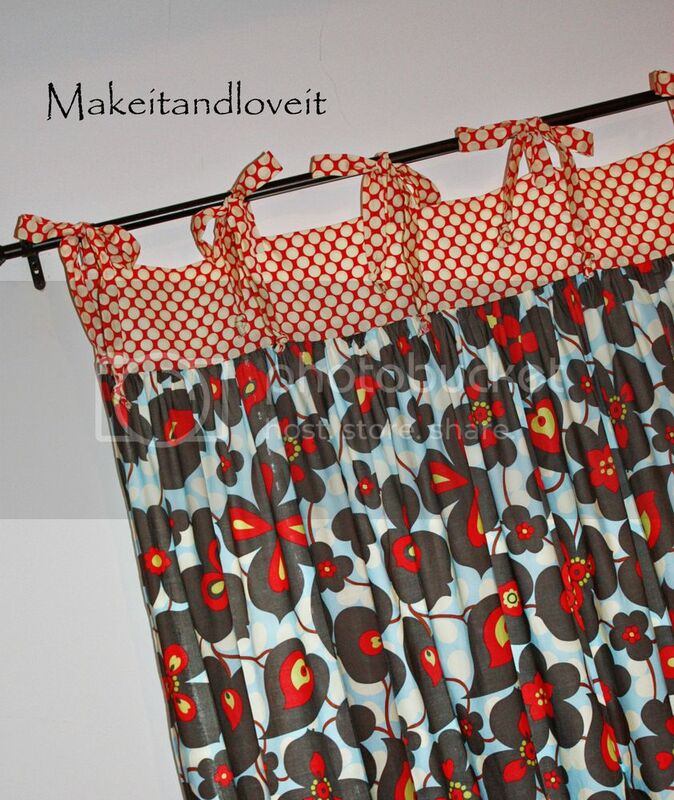 I have made many a dress with that, but never thought of curtains….now what room to redecorate!? By the way, for anyone interested, I tend to find fabric a little cheaper on Etsy! fabric.com is usually a little more. With a coupon, it might be about the same, but etsy is usually cheaper–for the fabrics I look for anyway! I love Amy Butler fabric but couldn't sew to save my life! :) Looks fabulous, nice job! Amy butler is great! you know what else you might like is spoonflower.com tons of great fabrics over there. Maggie, I cannot find the word super or ouper anywhere……I'm sure it's somewhere. Help!!! And Gwen, I wish I could paint, but we just rent. I may have to check out that color anyway. Thanks! Thanks Laura, I'm off to check out spoonflower right now. And Kimbo, you cracked me right up. Goldilocks is a good story though!! Ahh…those curtains are gorgeous! Just perfect for spring. These are FABULOUS! Thank you so much for sharing this tutorial, I'll be trying this too. Where do you find such lovely material?! No, really. Where? I am loving your makeover! So inspiring! I'll be linking to this. 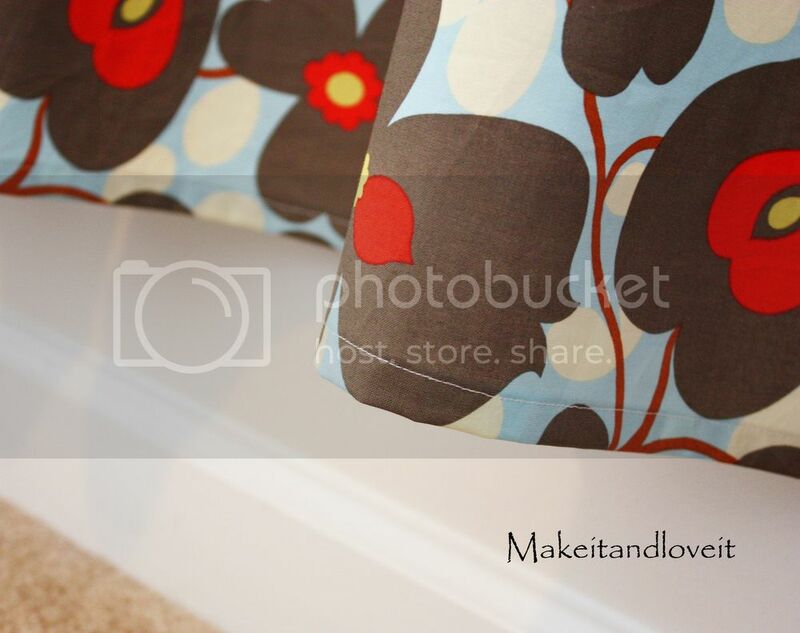 I want to make new curtains so badly now! I think the vibrant curtains look fabulous! Don't you hate making all those ties?! They are the worst part! I have been looking and looking for a simple way to make curtains without having to slide them on and off a curtain rod (yuck). I liked your other curtain tutorial, but couldn't find any curtain rods with clips like that. I am definitely going to try the ties now. We have two closets that are lacking doors (we too are renters). I can't wait to see how it turns out! Thanks for sharing! I love that material, where did you get it? I want to replace my bent and broken blinds. Oh how sweet! I love the gathers at the top. Just saw you on One Pretty Thing. I'm following you now. Can't wait to sit down and look through everything else you've created. Love that. I have a pull down shade that is nearing it's last pull, so I may have to get crafty pretty soon! I totally need some curtains. beautiful! Very talented. Love the fabric choice. How well do the curtains slide open & shut with those ties? I love the look, but I have to be able to slide mine easily. These are awesome! Thanks for the great description! 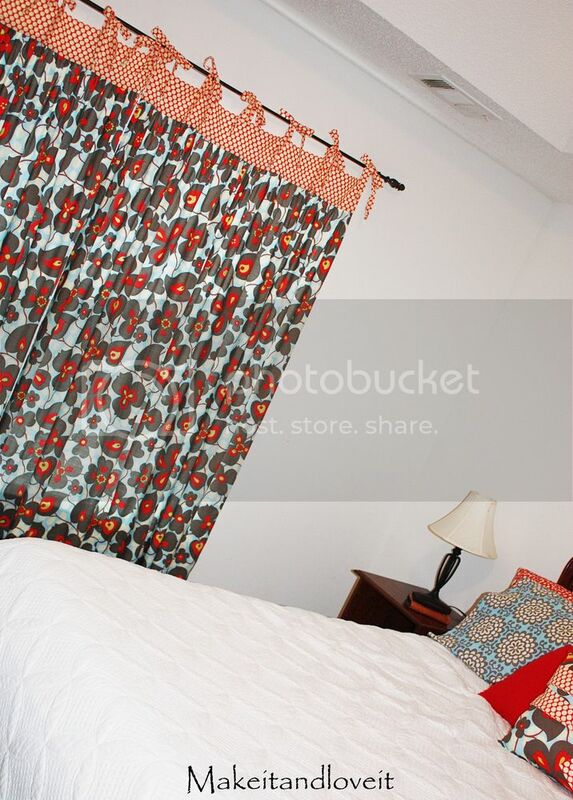 Have you any experience with the same basic concept, but with lined curtains? Think it would be hard to gather a double layer of fabric and make it look nice? Dear Ashley……Hi !..my name is soudeh. i m so glad to meet you! your art works are so lovely and full of life….i am jealous of you..your childs are so beautiful . i will learn from your ideas!!!! ^_^ . i love your works..i just want to thank you…..thank you very much!!!! i hope you a wonderful life, happiness and so many ideas……!!!!!!!! !